Some people sew because it is their hobby while some others sew because they earn a living through it. For people of both the categories, it is important to keep the sewing items organized. Sharp items like scissors and needles should be out of children’s’ reach. 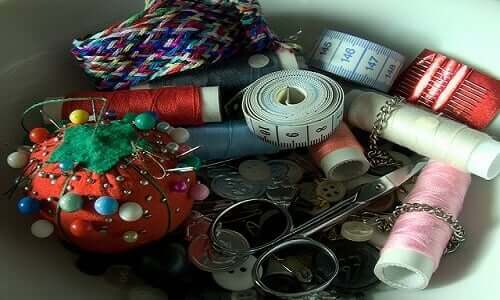 So, check out the following steps to keep your sewing items well organized. instead of the simple one. The adhesive measuring tape stays in its place and helps you to keep track of the length. You can simply apply such a tape to a saw station, a router table, or a work table top. The Starrett Measure Stix tape can be easily cut to custom lengths. You can pick bright Pro Tapes Pro-Measurement ruler tape that has an adhesive backing. This is a Yellow tape that’s easily visible from a distance. You can pick a wooden decorative sewing box from Overstock. This box can help you store your cash or sewing items safely. It gives an Asian and aesthetic charm to your home décor. This box can also be an antiqued decorative accessory featuring a faded and worn color. Constructed of strong and durable wood, this box is perfect for your sewing items. You can also check out some other sewing boxes online. Create a sewing box using an old box that’s available in the house. You can paint and decorate this box. Last but not the least, put all your sewing items in your box. You can use rectangular cardboard pieces to create different sections in the sewing box. This will help you organize your sewing box in a better way. You can keep the scissors in one section, threads in the second one and rest of the stuff in the third one.